Early in September, Gottfried Schulze, a retired professor of cybernetics at the University of Rostock, Germany, was working at his computer when he came across the website for the Friends of the Hamlin Beach State Park. After reading about the volunteer effort to turn the former CCC/POW camp site into a history trail, Gottfried addressed an email to the Hamlin website. He said that for a year and a half he had lived in the Hamlin camp as a POW and he had some “documents” he thought we might be interested in having. All he needed was an address and he would send them immediately. Gottfried’s email was forwarded to Ed Evans who promptly replied with his address and a list of questions. The next day Gottrfied emailed that the package had been sent. He even answered some of the burning questions the Hamlin volunteers needed the answers to. Having answered the questions, Gottfried said that he was going to step back and take some time to write some down some of his POW memories. He would send those memories in about a month and answer some more questions. Ed couldn’t wait that long. The next day he sent Gottfried a package of Hamlin history things - Mary Smith’s Hamlin History book, Mary’s 50 page pamphlet about the CCC camp, aerial photos of the CCC camp with the POW fence drawn in, etc. Another page of ‘burning questions’ was slipped in for good measure. When the package arrived, Gottfried broke his one month rule and emailed the answers to the second batch of questions. And a week later, the first installment of his memories arrived as an attachment to an email. Gottfried was on a roll! In the meantime, Ed had not forgotten the other living, former Hamlin POW he had been writing to. A quick look at a map of Germany showed that the two POWs lived less than one hundred miles apart. And Ed now knew something else no one else knew. Sixty- seven years ago, Heinrich had lived in the Hamlin camp while Gottfried was there and in the same barracks! They both worked in the same Hamlin canning factory and they were both still alive! An email was sent to the grandson of former POW Heinrich Willert telling him about Godfried Schulze, just in case he might want to line up another “pen pal” for his grandfather, Heinrich. To keep things moving, Ed sent another package to Gottfried - a couple of shirts with “Hamlin Beach State Park” printed on them, a Hamlin Beach State Park coffee mug, a wad of newspaper stories about the reclamation work being done at the CCC/POW campsite on Moscow Road, and another list of ‘burning questions.‘ While the package was somewhere in the air over the Atlantic Ocean, another email arrived from Gottfried - two more pages of Hamlin POW memories and a few questions of his own. Gottfried had joined the army fresh out of school at age 18. A short time later he was seriously wounded in Anzio and ended up on an American hospital ship. After treatment and recovery he was transferred to another ship which brought him to the United States. The next stop was the POW camp at Fort Niagara. He “only heard the water going over the falls for a few days” before being sent to the POW camp in Hamlin. It was August 1944 and there was a great demand for farm workers in the Hamlin area. Extra help was also needed at Duffy Mott’s canning factory in downtown Hamlin. The Hamlin POW camp was full to capacity and tents had been set up next to the wooden barracks to house the extra POW laborers. Gottfried lived a tent for a couple of months and when the harvest season was over, many POWs went back to Fort Niagara. Gottfried, however, had been fortunate enough to be given a job in the canning factory. Duffy Mott had asked government officials to change their rules and send them the same workers every day and the officials were obliging. Gottfried became one of those lucky workers and was given an upper bunk in barracks #3. Because of the Duffy Mott connection, he was able to stay in the Hamlin camp until it closed in January 1946 instead of being shuffled around the fourteen western New York POW branch camps. Gottfried’s shared memories of his stay in the camp have greatly helped the Hamlin volunteers who have been trying to piece together just what the POW camp must have looked like. We now know that was a camp store where we didn’t think there was one and there was a another building built into the fence that Gottfried is still trying to recall. In a recent email, he confirmed our suspicions that there were four guard towers at the camp, not two, and he has even described them. And we now know there was an open air jail cell in the camp because Gottfried stayed in it one night. According to Gottfried, “you could steal horses” with the seasoned guards (old German saying) but you had to watch out for the young ones. He has amusing stories to prove it. On October 4, while waiting for the next email treat to come from Gottfried, Ed got an email from Heinrich Willert’s grandson, Matthias. (Remember, Heinrich is Hamlin’s first POW contact.) Matthias was in Toronto on a business trip and wanted to meet Ed in person before going back to Germany. 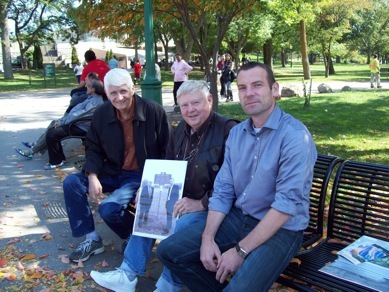 The next day, Ed and another Hamlin volunteer, Nick Kramer, met Matthias on the American side of Niagara Falls for a 45 minute crash course on the efforts to turn the CCC/POW campsite into a history trail. As luck would have it, Matthias said that he and Gottfried lived in the same city and he had arranged for a meeting between Heinrich and Gottfried! He thought the information would help him to better understand what was bound to come up at the long awaited meeting. Three days later, the big meeting took place. For 67 years neither man had thought for one minute that anyone was still alive who shared his POW experiences in Hamlin. One had survived the war in North Africa and the other in Italy. One became a college professor and the other had become a school principal but their paths had never crossed. Then on October 7, 2012, the improbable happened. 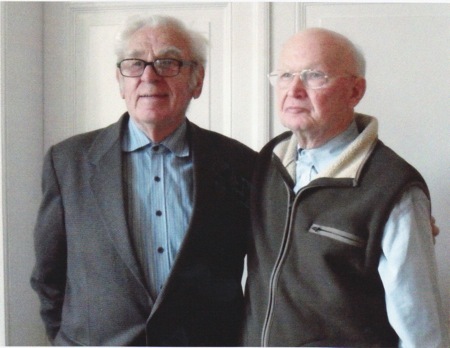 The two former WWII German POWs suddenly had a reunion!